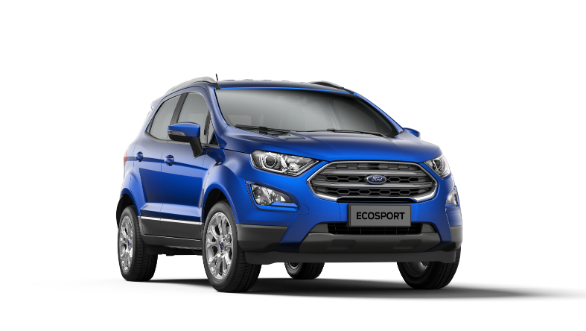 Ford India announced the launch of a new top-of-the line 2018 Ford EcoSport Titanium+ manual petrol variant today, priced at Rs. 10.47 lakh (ex-showroom, India). This Titanium+ trim adds the option of a 5-speed manual to the already existing 6-speed torque converter automatic and comes with 17-inch alloy wheels and six airbags. Other notable features include projector headlamps with LED daytime running lights, cruise control, Ford's Sync3 8-inch infotainment system with reverse camera, voice commands and Apple CarPlay/Android Auto integration. The petrol engine powering this is the new 1.5 litre three-cylinder motor that was introduced with the facelifted EcoSport in November last year. This 'Dragon' Ti-VCT naturally aspirated motor puts out 123PS of power and 150Nm of torque. The claimed fuel consumption for the petrol is 17 kmpl. This manual Titanium+ variant was already available with the 1.5 litre diesel motor but the addition of this trim to the petrol line-up allows Ford to better compete with cars like the Tata Nexon, Renault Duster and Maruti Suzuki Vitara Brezza. The EcoSport was one of the earliest entrants in the compact crossover space in India when it was first launched in 2013. However, newer rivals had since superseded it in terms of space and value. The recent facelift was aimed at remedying this situation and the announcement of this new variant is also another step to bring the EcoSport up to speed with rivals. Rahul Gautam, vice-president marketing at Ford India stated that this variant was being introduced to fulfill their commitment to meet customer demands and offer them a greater choice.